To know what kind of dark circles you have. Look straight into a mirror in natural light, then lower your chin slightly to expose the shadows under your eyes. This way, you’ll see clearly whether your circles are bluer or more brown. The cause: Blue circles result from oxygenated blood pooled beneath the under-eye skin. The skin here is very thin and almost transparent, so blood shows through. This is more noticeable in the morning: When we’ve been horizontal for a while, fluids accumulate and the veins expand to hold more blood. Blue circles may get worse with age. “As we get older, we lose subcutaneous fat, which can mask blueness below the surface of the skin. The cause: Brown circles result from hyperpigmentation, triggered by chronic eye-rubbing, sun exposure, or genetics. The skin under the eyes is thin and delicate, to begin with. As we grow older, the skin around the eyes becomes thinner making blood vessels more prominent, causing dark circles. Genetics - Hereditary, and genetics can also play a big role in the development and dominance of dark circles around the eyes. Nutritional deficiency - Dark circle around the eyes can be due to poor nutrition. A healthy and nutritious diet filled with vitamins like A, C, K, E, and nutrients can help to get rid of dark circles. Sleep deprivation and tiredness - A lack of sleep or excessive tiredness results in pale skin, making blood under the skin become more visible and appear more blue or darker. Smoking and drinking - Late night parties, smoking, and drinking can play havoc with your skin and result in dark eye circles. Dark eye circles could be a sign of loss of water from the body (dehydration) due to excessive drinking and intake of caffeinated drinks. Sun exposure - Increased exposure to the sun can draw pigmentation of the skin’s surface and create dark circles. Long sun exposure produces more melanin around eyes than usual, giving them a darker color. There are two main layers of skin, the outer layer of skin known as epidermis and inner layer known as the dermis. When excess melanin is being made in the epidermis it appears brown, and when there is more than usual melanin in the dermis it looks blue or blue-grey. Hormonal changes - In women, the skin undergoes lots of changes during the phase of pregnancy and menstruation, causing darkening under the eyes. Allergies - Any condition that causes the eyes to itch may contribute to darker circles due to rubbing or scratching the skin around them. Apart from that, some food allergies can also cause the area under the eyes to appear darker. In fact, dark circles in children often indicate allergy problems. Dark circles and anemia - Iron deficiency is one of the most common causes of inexplicable dark circles in many cases, which can be treated by making simple changes in your diet. Low iron levels are the most common form of anemia and result in poor oxygenation in body tissues due to low supply of oxygenated blood. Thus, always take a balanced diet rich in green leafy vegetable, dairy products and all types of fruits to keep your body healthy. Dark circles and dehydration - Dehydration is one of the most common reasons for dark circles under the eyes. The reason is the close proximity to the skin underneath the eye in relation to the underlying bone. When the body does not have a proper amount of water, the symptoms are often evident in this specific area. Thus it is advisable to have at least 8-10 glasses of water and include fresh fruit daily. It is also advisable to restrict the intake of caffeinated drinks such as tea, coffee, alcohol and other caffeinated drinks as it aggravates dehydration. Dark circles and liver disease - Dark circles also indicate liver dysfunction due to various liver ailments. An example of such a liver ailment is hepatitis. Remedies... So how you prevent them ?? Almonds are a true solution for many beauty problems. Oil - Before going to bed, apply a little almond oil over the dark circles and gently massage it into the skin. Leave it overnight. The next morning, wash it off with cold water. 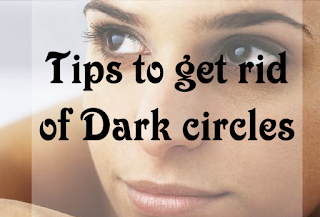 Follow this remedy daily until the dark circles disappear. Paste - Soak few almonds in water in the daytime and before you go to bed remove this almond from water and make them into small pieces now grind them into a thick paste by adding little milk and apply this under eye area and wash off in the next morning with warm water. Cucumbers have skin-lightening and mildly astringent properties that help fix those raccoon eyes naturally. Plus, they have a soothing and refreshing effect. Mix one teaspoon of tomato juice with a one-half teaspoon of lemon juice. Gently apply this mixture on the dark circles and allow it to sit for 10 minutes. Rinse it off with water. Follow this remedy twice a day for a few weeks. Simply using tomato juice will also work. You can also drink a glass of tomato juice with some mint leaves, lemon juice, and salt. For maximum results, be sure to drink this juice immediately after making it. Drink it once or twice a day for about a week.